Spoiler alert: There is a poem in this book about Kanye West called “Kanye West is not Picasso”! This collection of poems, lyrics, and miscellaneous items (even a text message) is quintessential Leonard Cohen. He poignantly express his dissatisfaction with modern culture and reflects on the past, which he still carries close to his heart. This program is read by Margaret Atwood, Rodney Crowell, John Doe, Jim Fletcher, Ari Fliakos, Maggie Hoffman, Ross Marquand, Will Patton, Seth Rogen, Michael Shannon, and Neela Vaswani. The Flame is the final collection of the seminal musician and poet, which he was determined to complete before his death. 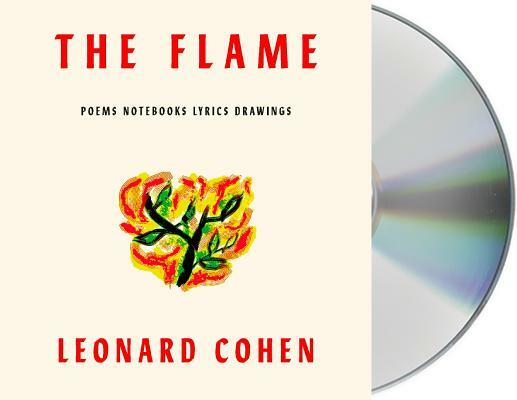 In addition to new poems about war, desire, regrets, lamb chops, and hummingbirds, and lyrics from his last three albums, including the chart-topping “You Want It Darker,” The Flame includes carefully selected excerpts from Cohen’s voluminous notebooks, which he kept faithfully over the years. Listeners will hear about the subjects that have always preoccupied Cohen: the dimensions of love, the secret code of existence, and the hope for transcendence in a broken world. In the words of Cohen’s longtime manager and friend, Robert Kory, The Flame “reveals to all the intensity of his inner fire” to the end. Leonard Cohen was born in Montreal in 1934. Soon after graduating from McGill University, he published his first collection of poems, Let Us Compare Mythologies, in 1956. He would go on to publish a dozen more volumes of poetry, including Book of Longing, and two novels, The Favourite Game and Beautiful Losers. A hugely influential and critically acclaimed singer and songwriter, Cohen released fourteen studio albums between 1967 and 2016, the last being You Want It Darker, for the title track of which he posthumously won the Grammy for Best Rock Performance. He was inducted into the Rock and Roll Hall of Fame in 2008 and the Songwriters Hall of Fame in 2010, and was honored with a Lifetime Achievement Award at the 2010 Grammys. He won both the Prince of Asturias Award for Literature and the Glenn Gould Prize in 2011, and the first PEN New England Song Lyrics of Literary Excellence Award in 2012. Cohen died in Los Angeles on November 7, 2016. Margaret Atwood is best known as the author of more than thirty books of poetry, fiction, and nonfiction, including The Blind Assassin, which won the Booker Prize. She has written several other children’s books, including Rude Ramsay and the Roaring Radish and Princess Prunella and the Purple Peanut. She lives in Toronto, Canada. Will Patton is an Earphones Award-winner and Audie finalist who has narrated works by Charles Frazier, Larry McMurtry, Don DeLillo, and Ernest Hemingway. He was named Best Voice in Mystery & Suspense by AudioFile magazine in both 2008 and 2009. Patton’s narration of Stephen King’s Doctor Sleep earned an Audie for fiction in 2014. Patton has also won two OBIE awards for best actor for the off-Broadway plays, Sam Shepard's Fool for Love and the Public Theatre production of What Did He See? He's appeared in a host of films including A Mighty Heart with Angelina Jolie, Knucklehead, Brooklyn's Finest, and Dog Days of Summer. His many television credits include The Agency, CSI: Crime Scene Investigation, 24, and Numb3rs.